Currently signed to the Hackney label M2Music Entertainment - Kelz is one of the fastest rising stars in the UK! The 21-year-old who was born and raised in Shoreditch, North London - Kelz bases his music on an amalgamation of jazz and blues filled with love/heartbreak melodies, and delivers lyrics filled with conviction, realism and punchlines. Receiving radio plays from various broadcasters including Amazing Radio with his breakthrough track, 'Breathe' and Demon FM with 'Kingdom Come' (oh the irony of that, lol!). Kelz who is also known as The Black Kupid has supported artists like the American Superstar Lana Del Ray at her Scala show in King's Cross and has also performed alongside Vince Kidd - The Voice star at Shooting Stars Benefit Launch 2012. 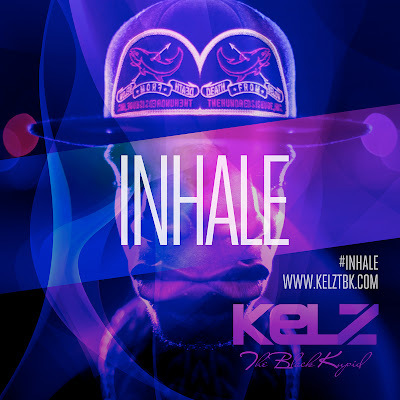 Now Kelz has teamed up with producer BMP for his new track 'Inhale', which is a lively piece of UK urban music sure to set the benchmark for the young artist in 2013. Expect more new music from this exciting one-to-watch in the coming weeks, including the highly anticipated follow up single 'Zeus', featuring lady of the moment Lady Leshurr.